2016-07-12 altti: went to Estonian summercamp this weekend to teach the children Tafl. I used Ard Ri and Tablut for demo and gave them printouts of other variant rulesets to play on their own. they enjoyed it very much. 2016-07-12 Sigurd: @Altti: Cool. How did leading with Ard Ri and then Tablut work with their ability to pick up the concept of the throne? Any difficulty at all? 2016-07-13 altti: @ Sigurd: it was easier to have only movement, capture and objectives to absorb on the first game. 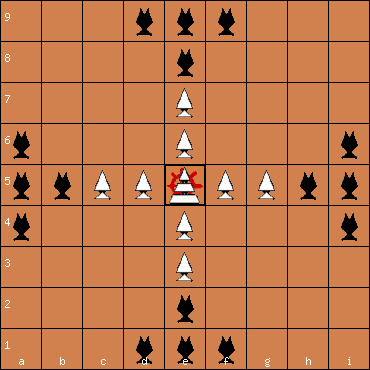 then the addition of throne with its change in capture strategies, and the exit at corner on the following game made it much faster to teach, with fewer questions. fewer variables and less confusion. 2016-07-15 14:23:34 fairland: How young were the children? I may be able to use a similar strategy with 15-16 year olds or do you think I would be over-simplifying? 2016-07-15 22:35:50 altti: @Fairland: 7 to 15yrs. the older kids were interested in additional variants very quickly. I'll try that teaching strategy a little later this year, to teach Welsh Tawlbwrdd. Status on the Historical Hnefatafl. The Historical Hnefatafl (king captured from 2 sides, except from 4 sides around the throne, wins on edge) is tested on several boards and works excellently, especially on the boards 9x9 and 11x11 described in historical sources by Carl von Linné and Robert ap Ifan. but this could probably be improved through a slight change in the initial setups of pieces. 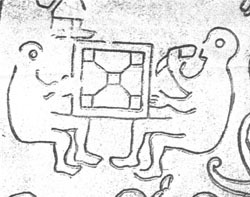 The Hnefatafl pictured on the Ockelbo runestone. The lost Ockelbo runestone pictured a game with throne and four corner squares marked. The diagonal lines drawn appear to tell us that the king has to travel from the center to one of the corners. 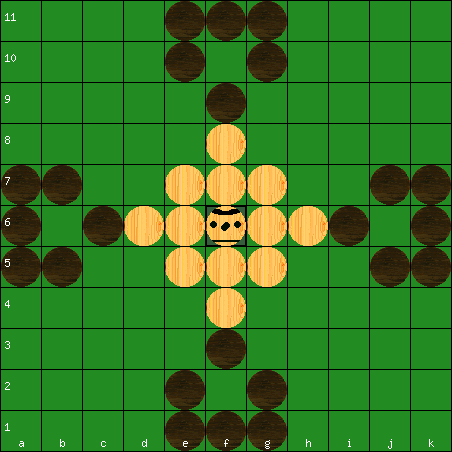 The Danish book "Board and Piece", 1992, attempted to give rules for such a game (the "Skalk Hnefatafl 11x11"): King captured from 2 sides, except from 4 sides around the throne, wins in corner; corners hostile, and the king can be captured against a corner by one attacker. So this is the historical rules with a win in corner. These rules however have a terrible balance, we measured 4 attackers' wins per 1 defenders' win (from 172 games). The Swedish Expomedia attempted to use the rules but on the smaller board 9x9. The balance improves but is still bad; we measured -1.72 (from 158 games). Changing the 11x11 setup of pieces to the one most in favour of the defenders (Lewis diamond), we still measured the bad balance -3.40 (from 22 games). There are no more 9x9 and 11x11 setups to try, so the best possible balance turns out to be the poor -1.72 (strong players -1.81 from 89 games). (Reducing the board size even further to 7x7 we found the balance +1.34 for "Brandubh cross 7x7"). To make it possible to move forward from here, I'd like to remove the distinction between throne and corner squares, so that all five king's squares are the same and have the same properties. The properties of the throne are described in historical sources, so the throne is kept unchanged, but the corner squares are given the same properties as the throne. This means that when the king is on a square next to a corner square, he must be surrounded from all sides to be captured, just as is the case next to the throne. Only, in the corner this is not possible due to the board edge, so the king cannot be captured next to a corner square anymore. This change is expected to better the balance considerably. We tested all possible Brandubh setups, and the best game balance found is +1.34 (from 926 games) (strong players .+1.41 from 457 games). On the weak throne, the king must be surrounded from 4 sides, but next to the weak throne the king can be captured against the throne by one attacker. So also here all five king's squares are the same and have the same properties, only this time it's the other way around and the five squares are given the properties of the classic corner square. The classic throne, which gives the king good protection both on and next to the throne, would then be a "strong throne". All thinkable setups are tried, and the best balance found is the poor +1.64 (strong players +1.82 from72 games), so Ard Ri continues as a mystery. It has not been possible to have the Historical Hnefatafl rules work on the very large 19x19 board of Alea Evangelii with the setup of pieces described in a medieval document.